Nostrils: These are the entry apertures to the nasal fossae located at the front of the nose, which lead to the nasal vestibule. Nasale: This is the most anterior part of the nasal fossae, limited laterally by the ala of nose and medially by the most anterior portion of the septum. This area extends in towards the fossae until the head of the middle and inferior turbinates. It is surrounded by the cartilages of the nose and covered by the skin of the nose. 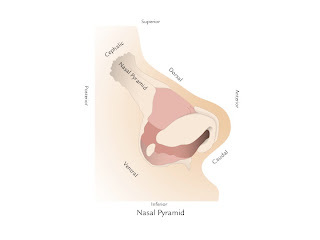 The piriform aperture is next, which then leads to the actual olfactory area of the nasal cavity, which extends to a space delimited by the lower edge of the middle turbinate on the outside and the tubercle of the septum on the inside, known as the olfactory groove. Choanae or posterior nasal apertures : These are apertures at the back of the nasal cavity which connect it with the nasopharynx. The lateral wall of thenasal fossae is comprised of the frontal process of the maxillary bone, the lacrimal bone, the ethmoidal labyrinth with its middle and superior turbinates, the inferior turbinate and the vertical process of the palatine bone. The point where the palatine bone is joined to the body of the sphenoid has an aperture called the sphenopalatine foramen, through which blood vessels and nerves enter the nasal cavity. The lateral wall contains the 3 nasal turbinates (also called nasal conchae). They are structures comprised of spongy bone, coated with a thin and delicate nasal mucosa, with rich and abundant blood irrigation. They are divided into the inferior, middle and superior turbinates. They are well irrigated by intramucosal arterial networks that come from the carotid system through the maxillary and facial artery, the drainage veins and the lymphatic system. Superior Turbinate: The superior nasal turbinate is formed by the rear part of the medial surface of the ethmoid labyrinth (ethmoid bone). Middle turbinate: The middle turbinate is formed by a lamella that emerges from the end of the medial surface of the ethmoid labyrinth (ethmoid bone). Inferior turbinate: The inferior turbinate (inferior nasal concha) is formed by a compact lamina of bone. It is in the lower portion of the nasal fossae. Between each turbinate and the lateral wall of the nasal fossae there are three canals located in the anteroposterior direction, called the meatuses. There are three meatuses, the superior, middle and inferior, whose content drains to other structures. Superior nasal meatus: The superior nasal meatus is the smallest of the three. It occupies the middle third of the lateral wall of the nasal cavity. It lies between the superior and middle nasal turbinates, between the posterior ethmoid cells at the front and the sphenopalatine foramen to the rear. Middle nasal meatus: The middle nasal meatus is a nasal aperture situated between the middle and inferior conchae. It communicates with the infundibulum through the hiatus semilunaris, and at the front through the anterior ethmoidal cells. Inferior nasal meatus: The inferior nasal meatus is the largest of the three. It is the space between the inferior turbinate and the floor of the nasal cavity. The entry to the nasolacrimal duct is located in its most anterior portion. All the nasal fossae are coated by ciliated respiratory epithelium that permits the removal of the mucus produced by the mucous glands. Nasal septum is an osteocartilaginous laminar structure located on the medial part of the nasal pyramid. It forms the internal wall of both nasal fossae. Vomeronasal organ or Jacobson's organ, is an auxiliary organ of the sense of smell. 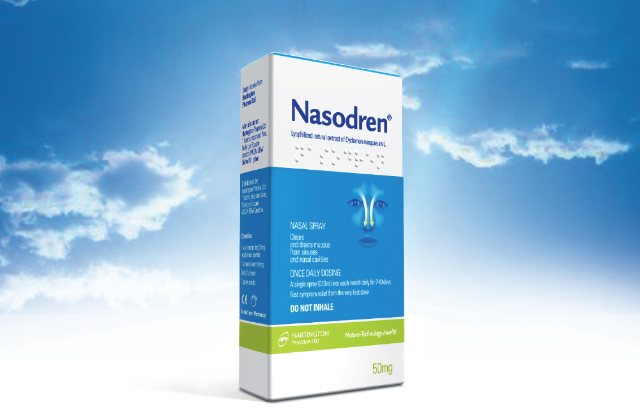 The nasal or pituitary mucosa covers the perichondrium and periosteum of the walls of the nasal cavity, smoothing out their irregularities and covering vascular and nervous bone apertures. The mucosa continues with the mucosa of the sinuses and the lacrimonasal duct. The nasal mucosa presents two very morphologically and functionally different areas: respiratory mucosa and olfactory mucosa. The epithelium covering the mucosa varies in structure depending on the functions performed, to guarantee the filtration and drainage of the particles of inspired air.